Winter? Bleak. Frosty wind, earth as iron, water as stone, so the old song goes. The shortest days, the longest nights. The trees are bare and shivering. The summer's leaves? Dead litter. The world shrinks; the sap sinks. But winter makes things visible. And if there's ice, there'll be fire. It's the season that teaches us survival. 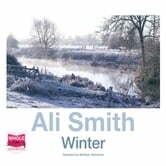 Here comes Winter the second novel in Ali Smith's shape-shifting quartet of novels.